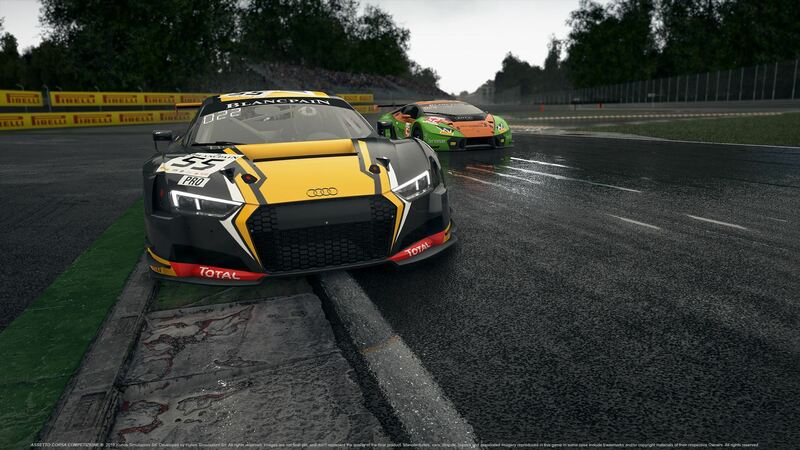 Discussion in 'Assetto Corsa Competizione' started by GTPNewsWire, Jun 30, 2018. This article was published by Kyle Patrick (@SlipZtrEm) on June 30th, 2018 in the Assetto Corsa Competizione category. EmArA, marcvic, JoueurGT and 1 other person like this. It is looking great in alpha. There is a new thread @racedepartment where an attached article has an interview with Aristotelis Vasilakos claiming September as the release. We'd like to see EA sooner, but that would still fall within their original announcement as summer in the northern hemisphere ends September 23. Were those clips supposed to be in 4k? Because all I saw was 1080p. I like how the numbers on the windshields lit up. I'm willing to bet that isn't coming to console????? Does anyone know???? I predict a PS5 release. This + this + this or this and this = a sim racer's ultimate dream coming through. FKAustria1911 and Jezza819 like this. They said that they develop first and foremost for PC and just after that they will look into a potential console release. It depends whether or not the game still will work as they expect it to work when trimmed down for consoles. But as of now, all work is going into the PC version until the full release. Yes motorsport focus is not for everybody. The graphics is already impressive, maybe even surpasses GT Sport. Now, it's time for other improvements. Difference being that the game is coming out later this year. Whereas GTS came out over 2 years after its first showing. But as of now, all work is going into the PC version until the full release. They are coding "with console in mind" and also making builds on console. https://www.gtplanet.net/forum/thre...t-at-e3-next-week.378783/page-2#post-12352460. lancia delta hf, CTstryk and th3o like this. Graphics talk, blah it'll look fine on Unreal it's how it feels on the wheel that matters. Which I also think will be as expected, it really comes down to if you want a sim that focuses on one breed of motorsport. I think the entire approach is a breath of fresh air, by not cramming as much content as possible and doing one gt series very well. Focus on PC, get it tight then look to console maybe throw in some gt4 dlc down the line. EmArA and lancia delta hf like this. Difference being that the game is coming out later this year. Where did you get this piece of information? I only know of Early Access "Summer 2018". The Early Access is coming out later this year. The final Game is coming out the next year. And do you saw AC1 on 2013 (Early Access) and 2014 (1.0) or 2015 (1.5)? Whoops sorry, I got confused with the early access. seco46 and th3o like this. So it's only the early access coming out this year (September??) And full game next year? I thought the full game came out this year so it's only the early access? EA by end of summer, 1.0 next year. Really itching for the EA...It was end of june when it was added to the wishlist on steam back in Jan. will it slip to September? Maybe but i can see why.